Mighty Mite Romney is using robo-calls to urge voters in four states to support Marco Rubio in today’s GOP primaries. Also, in one state he urges support of John Kasich, as well as Rubio. In all calls he disparages Donald Trump, and doesn’t mention second-place Ted Cruz. To the untrained eye (or ear?) this is very confusing, especially when Romney reps declare that they will also be helping Cruz in the future, but not today. They say it’s all an effort to block Trump from winning the party’s Presidential nomination, despite his near universal approval by voters in national polls. While you might disagree with Trump on many issues, nearly every American is disgusted with a campaign finance system that allows the very rich to give millions to elect their stooges to public office. Both Trump and Bernie Sanders have railed against the super pacs and their hidden contributors. Trump has especially ranted against those who pull the strings before and after elections, and he has been attacked by the rich interests, who want to continue their control of the electoral process. The big money, big control boys are nervous, very nervous over the prospect of a Sanders or Clinton victory. At this point Trump seems more likely to gain the prize (unless there is a F.B.I. surprise) so most guns are directed at him. Assume the biggest power brokers among the wealthy are the ones most alarmed. The Koch brothers, sons of the founder of the John Birch Society – that refuge of the hysterical – reportedly plan to spend more than $800 million on 2016 campaign funding. By contributing to pacs and front groups, it will be difficult to trace all that money, but here’s a clue on why Romney was attacking Trump today. In July 2012, David H. Koch hosted a $50,000-a-person ($75,000 a couple) fundraiser dinner for then GOP Presidential candidate Mitt Romney. Koch Industries said the resulting protests from progressive groups was an example of what they saw as liberal hypocrisy regarding fundraising as these same groups don’t protest big money donations for Democratic fundraisers. Two wrongs make it right? William Koch, David’s younger brother, gave $1 million to Restore Our Future, a super-PAC backing Romney. During the 2008 presidential race, David Koch donated $2,300 to Romney. None of these reported contributions included money hidden from public view by current election laws. When millions of Americans answer their phones in four states today, it seems fair to say they will hear the robotic voice of Romney, and the evil words of the Koch brothers. Learn about the vast network of “fact facades” that feed into the establish narrative. 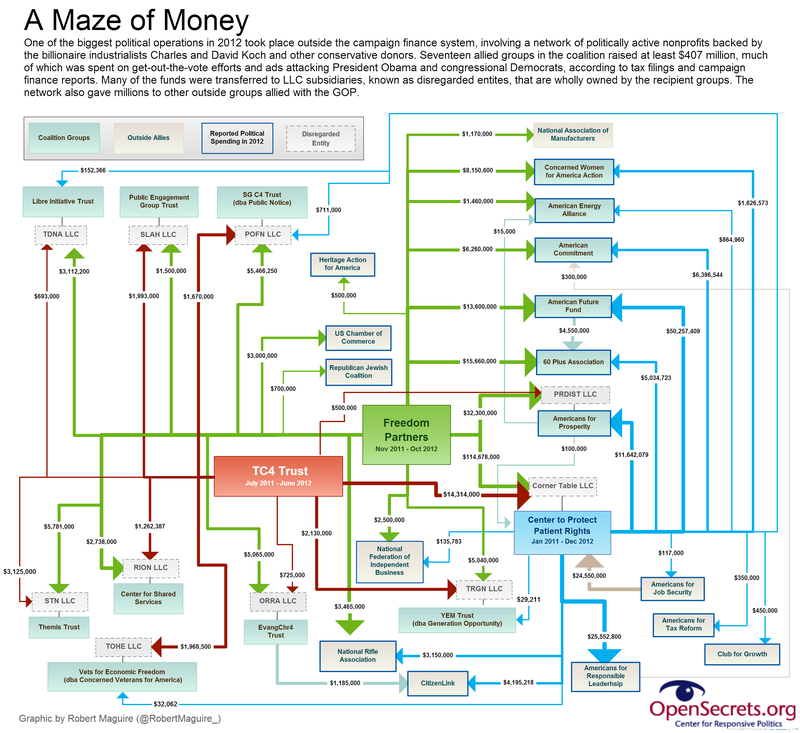 Nearly every group that send pundits to fill the TV screens and airwaves can be found to have connections as shown on this chart. They influence both Democrats and Republican legislators as well as most of the candidates – with notable exceptions…follow the money, honey!